Police report that at about 10:09 pm on February 19, they learned of possibly suspicious activity occurring in the area near the intersection of Church Hill Road and The Boulevard, so they responded to investigate. That investigation resulted in police then charging motorist Hysen Braholli, 21, of Newtown, with failure to display marker plates and with failure to have automotive insurance. Braholli is scheduled to appear in court on March 5 to answer the charges, according to police. 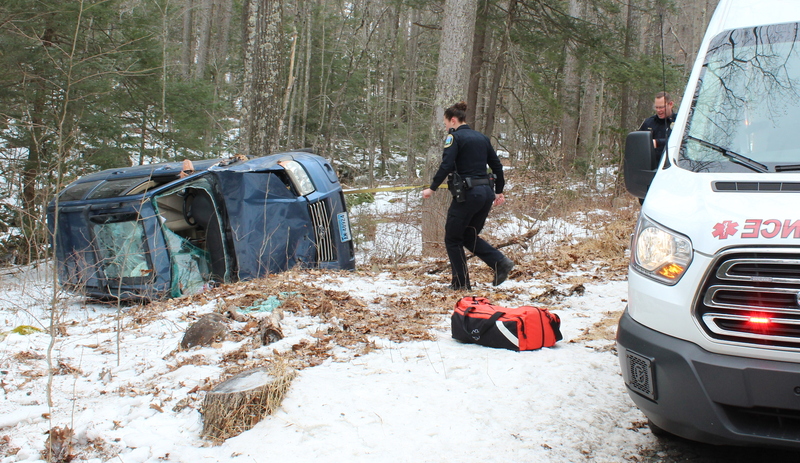 Police are investigating a vehicular accident that occurred early on the morning of February 18 on Taunton Hill Road, at its intersection with Sturges Road. At about 12:25 am, a resident heard a crashing noise there, after which the driver of the vehicle involved in the collision drove away from the scene, police said. The vehicle had been traveling northward on Taunton Hill Road and then drove off the roadway, struck a street sign and then hit a stone wall. Police said the vehicle that was involved in the incident may be a 2013 or 2014 gold-colored Nissan Altima, which has substantial damage to its front end. Police said they received a call reporting a domestic dispute at a Newtown residence early on the morning of February 16, after having responded there late on the night of February 15 for the same reason. While they were investigating the second call, Gregory Leonard, 40, who lives there, became “agitated and enraged,” resulting in a physical altercation between Leonard and police. Police charged Leonard with disorderly conduct, interfering with police, and assault on a public safety officer. Police initially held Leonard, after which they released him on $10,000 bail for a February 19 court appearance. Police report that at about 1 pm on February 15, they received a call from a patron at Carminuccio’s Pizza & Subs at 76 South Main Street reporting that another restaurant patron appeared to be intoxicated. The caller expressed concerns that the apparently intoxicated person would attempt to drive away in an unsafe manner. Police went to the restaurant to investigate, after which they charged David Kreshpan, 25, of Sandy Hook, with possession of narcotics and with driving a motor vehicle while under suspension. The Newtown Volunteer Ambulance Corps transported Kreshpan to Danbury Hospital for a medical evaluation, police said. Police report a two-vehicle accident at the intersection of South Main Street, Mile Hill Road, and Country Club Road about 6:20 pm on February 14. The collision involved motorist Raymond Gottschalk, 41, of Woodbury, who was driving a 2016 Dodge Ram pickup truck, which struck the rear end of a 2013 Toyota Corolla sedan driven by Richard Honafius, 49, of Milford. There were no injuries. Police verbally warned Gottschalk for failure to drive a reasonable distance apart. About 6:32 pm on February 14, motorist David Woessner, 63, of Trumbull, was driving a 2012 Volvo XC-70 SUV southward on Hattertown Road, police said. At that time, motorist Hannah Weatherby, 16, of Newtown, who was driving a 2007 Honda Pilot SUV, stopped at a stop sign on Oak Ridge Drive at its intersection with Hattertown Road. The Honda then attempted to turn left to enter northbound Hattertown Road, but the two vehicles collided. There were no injuries. Police issued Weatherby an infraction for failure to grant the right of way at a stop sign. About 7 am on February 13, Seth Bailey, 24, of Rocky Mount, N.C., who was driving a 2015 Freightliner tractor-trailer truck southward on Mount Pleasant Road, near Johnnie Cake Lane, crossed the snowy road’s center and then struck some guardrailing along the northbound road shoulder, police said. The truck came to rest extended across the width of the road, resulting in an extended road closure. Newtown Volunteer Ambulance Corps transported Bailey to Danbury Hospital to be checked for a possible head injury. Hook & Ladder firefighters also responded to the scene. The incident closed Mount Pleasant Road in that area for an extended period. Police issued Bailey an infraction for traveling too fast for conditions. About 3:54 pm on February 13, motorist Jack Kuligowski, 16, of Sandy Hook, was driving 2009 Honda Civic northward on Gelding Hill Road, near its intersection with Lakeview Terrace, police said. The Honda then went out of control on the paved road, which had a wet, sandy surface. The vehicle traveled off the right road shoulder and struck a utility pole, causing it to slightly shift its position. There were no injuries. Police issued Kuligowski an infraction for traveling too fast for conditions. State police report that motorist Joseph Wagschal, 35, of Monroe, N.Y., was driving a 2017 Chevrolet Silverado pickup truck on westbound Interstate 84, near Exit 11, amid slippery conditions, about 1:21 pm on February 12, while in the left lane of three lanes, the truck spun out and traveled across the roadway, striking a light post on the right road shoulder and knocking it down. There were no injuries. State police issued Wagschal an infraction for failure to maintain the travel lane. Motorist Clinton Bass, 56, of Waterbury, who was driving a 2010 Honda Civic eastward on Interstate 84, near Exit 10, at about 3:21 pm February 12, in hazardous conditions due to snowfall, was negotiating a curve to right, but lost control of the auto and struck some guardcabling along the right road shoulder, state police said. There were no injuries. Enforcement information was not available. Police said they received a report from an employee at a business at Sand Hill Plaza at 228 South Main Street at about 10:11 am on February 11 stating that a customer who had driven away from the business, but who then remained in the plaza’s parking lot, had been acting suspiciously, after which police responded to investigate. Police said they found the vehicle in question and interviewed the driver, after which they charged motorist Deborah Doyle, 62, of Newtown, with driving under the influence. After processing, police released Doyle on $65 bail for February 21 appearance in Connecticut Superior Court in Danbury. Police said that at about 1:34 pm on February 11, motorist Michael Paradise, 33, of Redding, who was driving a 1998 GMC Jimmy SUV southward on Poverty Hollow Road, south of its intersection with Hattertown Road, crossed into the northbound lane and then sideswiped a northbound 2008 Land Rover LR-2 SUV driven by motorist Albert Pfister, 59, of Sandy Hook. Ambulance volunteers responded to the scene to evaluate Pfister for a pain complaint but did not transport him. After investigating, police charged Paradise with failure to drive in the proper lane and driving with a suspended license. Police also learned that there were warrants pending against Paradise, after which they charged him with two counts of violation of probation and with two counts of second-degree failure to appear in court. Police held Paradise on bail for a February 13 court appearance. On eastbound Interstate 84, about one half mile east of Exit 9, at about 3:17 pm on February 11, motorist William Gallo, 26, who was driving a 2005 Subaru Legacy sedan, while changing travel lanes sideswiped motorist Adam Peppe, 28, who was driving a 2008 Ford Edge SUV, state police said. There were no injuries. Gallo received an infraction for making an unsafe lane change. Police report that at about 5:30 pm on February 11, they went to the residence of Jessica Guay, 37, in Sandy Hook and served an arrest warrant against her, charging her with using a motor vehicle without the owner’s permission and with driving with a suspended license. After receiving a complaint on the night of January 16, police investigated a report that Guay had borrowed a vehicle, but had failed to return it to the owner. Police then submitted an arrest warrant application at Connecticut Superior Court in Danbury, after which a judge issued the warrant on February 6. Following her arrest processing on February 11, police released Guay on a written promise to appear in court on February 27. Police report a two-vehicle accident at the intersection of Church Hill Road and The Boulevard about 2:23 pm on February 7. Motorist Donald Fletcher, 70, of Newtown, who was driving a 2009 Toyota Venza eastward on Church Hill Road, stopped at a red traffic signal at the intersection, after which the Toyota was struck from behind by an eastbound 2002 Toyota Camry driven by Antonio Olivo DeLeon-Pena, 57, of Hollywood, Fla. There were no injuries. DeLeon-Pena received an infraction for following too closely.